Born in 1946 in Leningrad, Mikhail Kopylkov graduated from Leningrad Higher Art and Industrial School named after Vera Mukhina (1969). He joined the USSR Union of Artists in 1975. 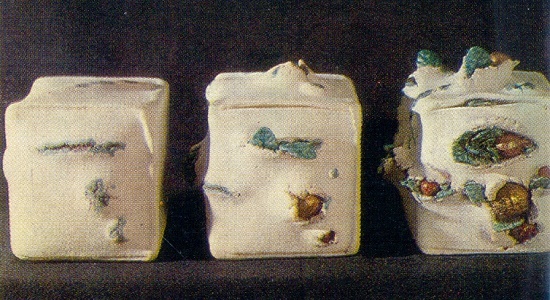 Annual exhibitions “One Composition” were of great importance for the history of Soviet Leningrad ceramics, the first of which took place in 1977. According to the charter, the artist could put out only one work, which he chooses himself. 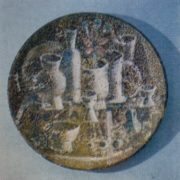 A month later, a large exposition “Ceramics of Leningrad” became the first serious review of Leningrad ceramics in the last five years. Criticism rated it as one of the most interesting phenomena in decorative art. 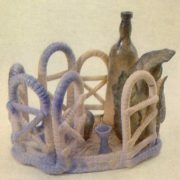 The notion of “school of Leningrad ceramics” appeared. 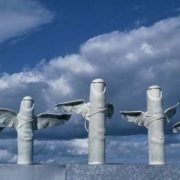 Meanwhile, since the beginning of the 1970s, a group of young artists-ceramists, graduates of the Leningrad Higher Art and Industrial School has been actively working in the city on the Neva. In particular, A. Zadorin, N. Savinova, V. Gorislavtsev, V. Tsyvin, L. Solodkov, N. Gushchina, O. Nekrasov-Karateeva and others. Among them one of the brightest figures was Mikhail Kopylkov. The acquaintance of the Leningraders with his works began with an exhibition of young applied artists in Elagin Palace (1973). 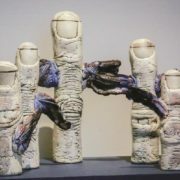 There exhibited a large group of works: “Autumn Still Life”, “Belfry”, “Chair” – volumetric spatial compositions in ceramics that were very unusual for the Leningrad exhibitions. 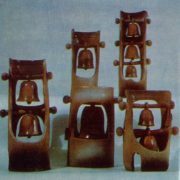 The purpose of these things was unclear: they too much gravitated toward the objective world so that the viewer could perceive them as a sculpture, and at the same time, it was difficult to classify them as something of “decorative object”. The strangeness of these things was that they looked even more modest than in life: dark, unattractive, down to earth, but they had the sharpness of a figurative beginning. It was more customary to look at pottery as a spectacular “decoration.” Even more impressive was the composition “Pink dress and autumn coat”, which appeared at the exhibition “One composition-77” and caused a variety of judgments. 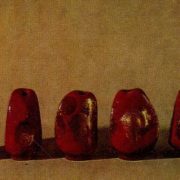 Some considered it to be “non-ceramic,” made-up, dry, others admired the philosophical depth, expressiveness of the material. Among other works by Kopylkov, evaluated in a similar way were “The Power of Life”, “The Post Mortham”, and “The Pack”. 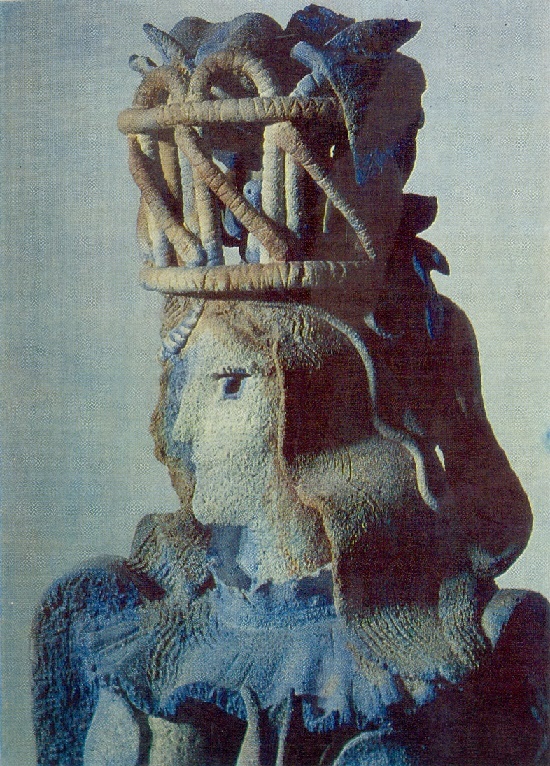 However, despite the polarity of the ratings, Kopylkov became recognized as one of the most brilliant ceramists in Leningrad. Pottery attracted him not immediately. In his youth, he dreamed of being a graphic artist. Entering the Leningrad Higher Art-Industrial school, he was reluctant to study for the first few years until he met VS Vasilkovsky, professor of the chair of ceramics, architect, graphic artist, and ceramist. It was Vasilkovsky who opened his eyes to the compositional possibilities of ceramics. 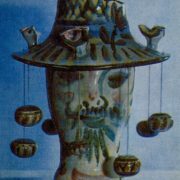 Attitude to ceramics as a material for painting was peculiar to Kopylkov for a long time. Once he tried to make a “self-portrait”, having squeezed in the clay his palm, objects caught by the hand, with a contoured outline, having outlined his face. Starting from this work, graphic motifs “grow into” volume, acquiring a third dimension. The Teapot Poet (1973) arose as one of the first attempts to fuse the visual motifs with the non-specific form of the subject. Here for the first time a very important topic for the artist appeared: “man-nature”, “man-object”, “man-theater”. Following the “Poet” arose the “Seller of the Raskiday” (1973), inspired by the impressions of childhood. In the postwar years at fairs, in the bazaars, one could see a disabled handicraftsman, hung with scatterers, whistles, birds twitching on laces. All this motley detail scribbled, trembling; and for a child such a seller was a living toy, a living, mobile “theater”. 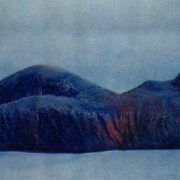 It is easy to see that during this period Kopylkov is working with the objective form, trying to “humanize” it, to involve in the visual world. 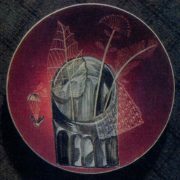 The metaphorical interpretation of the subject is to some extent connected with the art of A. Tyshler – one of Kopylkov’s favorite artists. The theatrical convention is close to the conventionality of the subject matter, felt by Kopylkov, it resembled a kind of “theater” in ceramics. 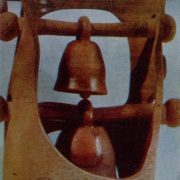 In the same, in 1973, he created the composition “Tet-a-tet”. 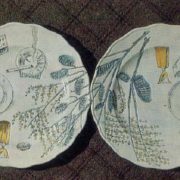 The composition included two porcelain plates, on which an easy graphic line outlines a still-life. 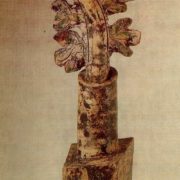 And symmetrically – two cups, two glasses, small things that are unstable in the orbit of the circle, a branch of the mimosa that perches through the air, which seems to be tearing away from the space of the plate. No matter how witty Kopylkov is in the “game” with the objective form, he became interested in free plastic. 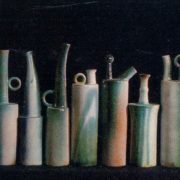 So, in 1973 he moved to Dzintari, and joined the creative group of ceramists. Back to Leningrad he brought six spatial compositions: “Autumn Still Life”, “Dryad”, “Woman’s Head”, “Torso”, “Belfry”, and “Chair”. A great impression in Latvia he received from the works of Baltic artists. For them the language of ceramics is familiar, native, closely related to their nature and way of life. 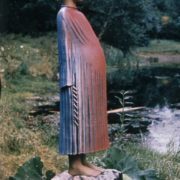 The genre of the pottery, the nature, the earth, the fullness of the air, the fire and sun, its proximity to human habitation, the artist himself has felt through familiarity with the Baltic nature and art. Working in Dzintari helped Kopylkov establish himself in the way of figurative-associative thinking. He very quickly mastered the language of ceramics, and acquired the ability to think with plastic symbols. Two years later, here, in Dzintari, Kopylkov performed the sculpture “The Gardener”, in which he summarized what was accumulating in the “Autumn Still Life” and “Dryad”. 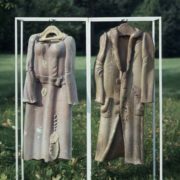 In 1977, at the exhibition “One Composition” Kopylkov showed one of the most controversial of his works – “Pink dress and autumn coat”. According to the critics, they found elements of mulia, naturalism, and the influence of Western pop art. Meanwhile, Kopylkov repeatedly participated in international art exhibitions. In 1975, his composition “The Seller of the Raskid” received the diploma of the city of Dresden (exhibition “We are brothers”, Dresden – Leningrad). 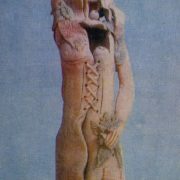 In addition, in 1978, the composition “The Power of Life” won the gold medal of the VI International Biennial of Ceramics in France, in Valloris. Mikhail Kopylkov is not only an artist, but also a master. His art is work in the most direct, physical sense. All of his things are worked with the conscientiousness of the master. He seeks to achieve such a saturation of ceramics so that it has “pores”, like a living being, so that, like in organic tissue, every centimeter “breathes”. 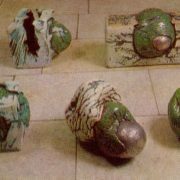 Kopylkov perceives ceramics as a metaphor for flesh, matter, never dead for him, but forever able to impart the power of life. 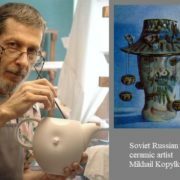 The works of Soviet Russian ceramic artist Mikhail Kopylkov are in museums and art galleries in Russia and aboad. In particular, the State Hermitage Museum, the Tsaritsyno Museum, the Russian Federation Museum, the Sergiev Posad State Museum of History and Art, and the Omsk Regional Museum of Fine Arts of M.A. Vrubel Museum. In addition, in the Moscow Polytechnic Institute, the Moscow State Institute of Architecture, in Kuskovo, Astrakhan, Kaliningrad, Sumy, Ukraine. Besides, in the International Ceramics Museum, Kecskemet, Hungary, Ceramics Museum “Palazzo Perabo”, Laveno Mombello, Italy, North Arizona University Museum of Art, Flagstaff, USA, “Arts and Crafts”, Seoul, South Korea, domestic and foreign private collections and collections of various institutions.